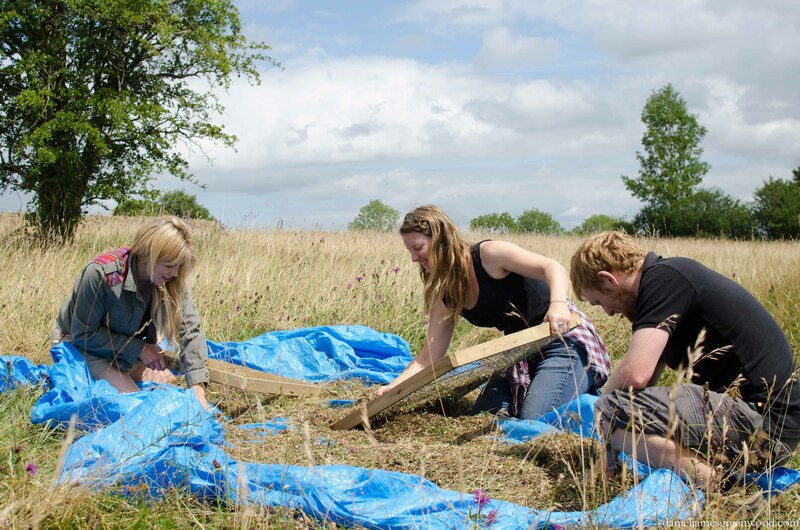 In July 2015 I volunteered with the Cotswolds Area of Outstanding Natural Beauty (AONB) to help with the harvesting of wildflower seeds from hay meadows and other species-rich grasslands. 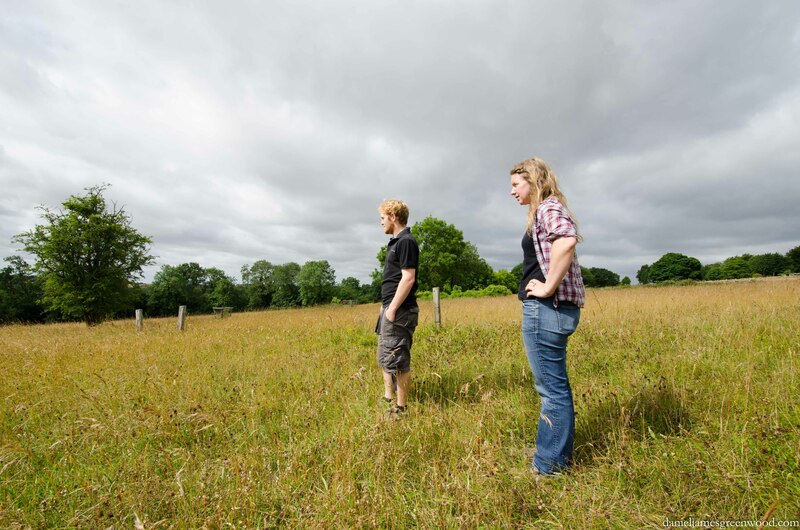 The Magnificent Meadows project is partnered nationally between the AONB, the Wildlife Trusts, Plantlife and the RSPB. I was helping Conservation Officer Eleanor Reast and volunteer Will Bowers. 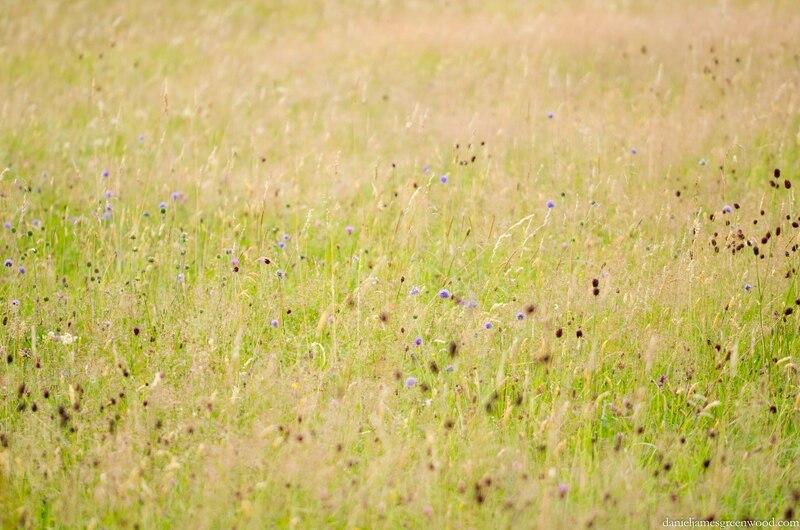 Since 1945, 97% of British wildflower meadows (hay meadows, water meadows, chalk and limestone grassland) have been lost. There are many reasons for this and there are a number of projects to raise awareness and physically restore this near-obliterated habitat. 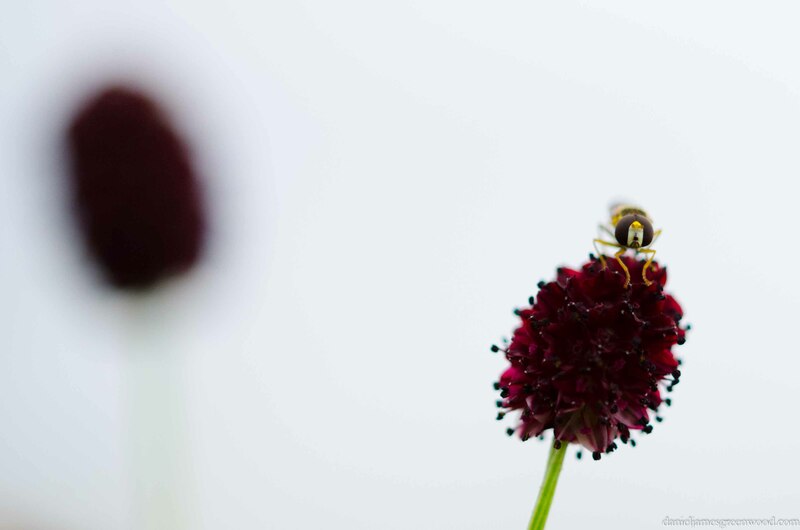 The loss has been catastrophic for invertebrate populations, namely the bees which are popular whilst their misunderstood habitat continues to decline. 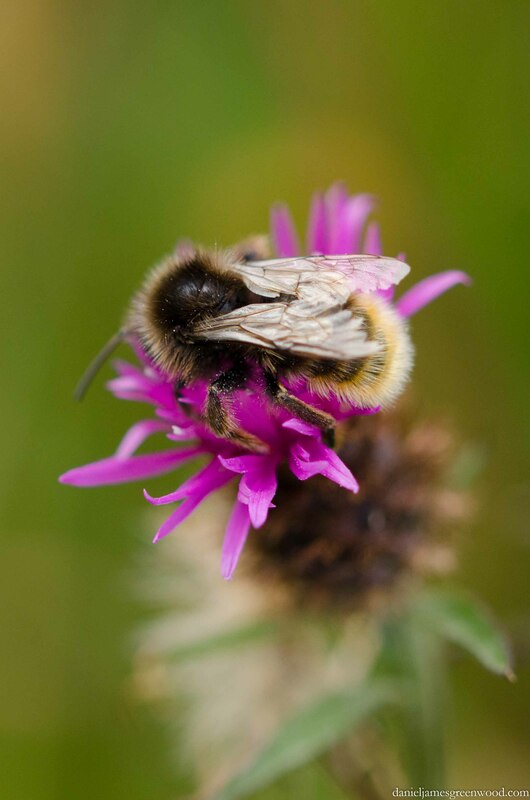 I don’t mean honeybees specifically, they play an important role in pollination but the biggest and most concerning losses are to bumblebees, with some of the rare species now confined to coastal meadows and grasslands. 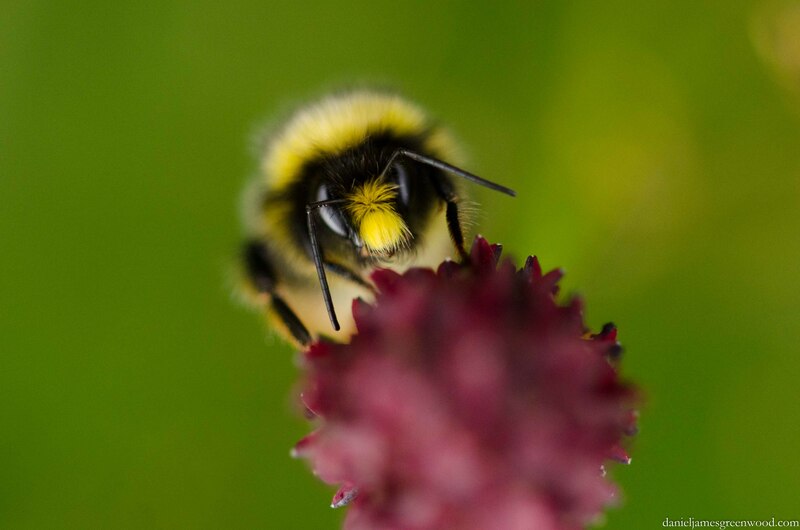 The Bumblebee Conservation Trust estimates that bees provide £560million to the UK economy through pollinating high value crops. But bumblebees are only a fraction of British species: there are around 250 species, 32% of which are threatened with extinction. Solitary bees make up much of the numbers here, with an amazing array of species having taken to different niches and areas of our landscape, giving us mining, mason and leaf cutter bees. Wildflower-rich meadows, along with woods, should be the fulcrum of support for our rural wildlife, instead the former has been near-destroyed and millions of pounds are now rightly being invested in their regeneration. At the same time government continues to build on remaining rich grasslands and open up more areas for fracking. 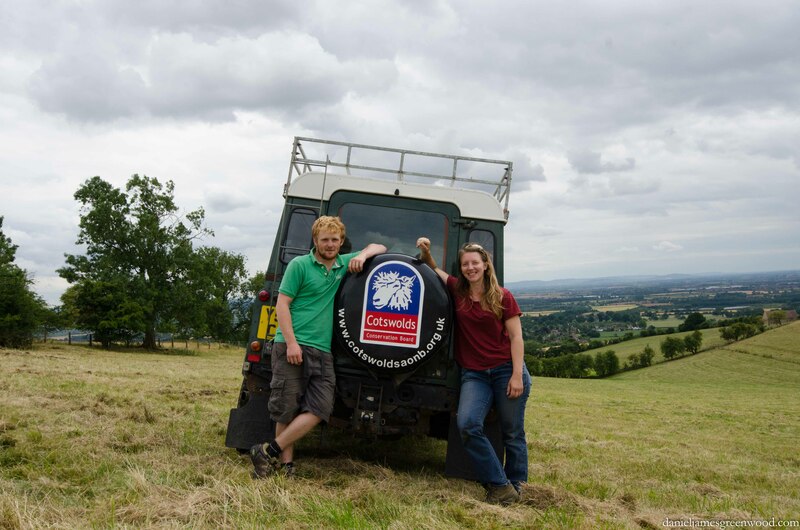 The AONB is vast and the job of Eleanor and her colleagues is not a simple one. 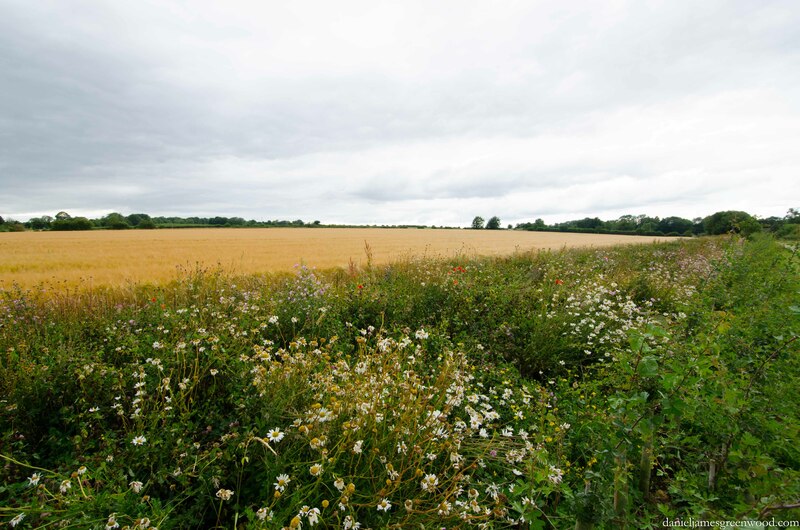 The project aims to work with local landowners both to collect seed from their meadows but also to re-seed new grasslands where the soil conditions are suitable. Flower-rich grasslands are generally nutrient poor, this means that they haven’t been fertilised with chemicals or dung (also human excrement as I learned in the Cotswolds). This is vital because if the soil is too nutrient-rich, dominant species like nettle, bramble and hogweed will begin to overtake. Species-rich grasslands are often also rich in waxcap fungi. However, according to George Peterken, the nitrogen emitted into the atmosphere by car engines and through aviation is leading to rainfall that is actually fertilising grasslands and reducing the range of fungi as well as wildflowers. Orchids are impacted here as some species have intricate, symbiotic relationships with fungi, and the loss of fungi can therefore impact the meadow ecosystem in subtle ways. 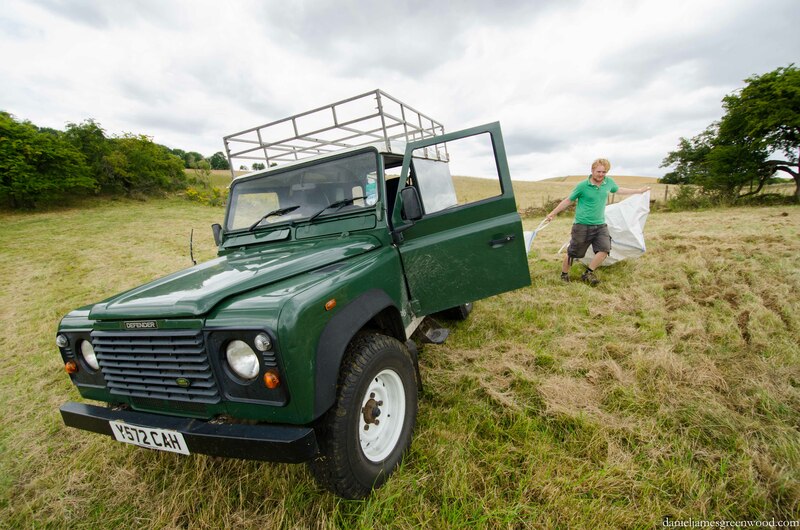 Harvesting the meadows required a Land Rover to drag the seed harvester around the landscape and a trailer to get the thing out there. I spent most of my time trying to sift the collected seed of knapweed, yellow rattle, orchids and scabious, or else trying to photograph insects. We were visited by BBC Countryfile’s Ellie Harrison, who is also the President of the Gloucestershire Wildlife Trust. Ellie is helping with the Magnificent Meadows project and was keen to see, first hand, how the work was going. 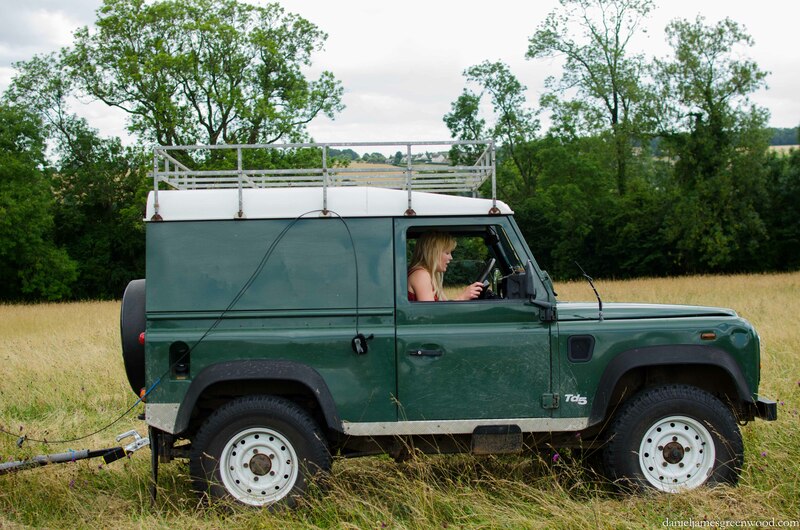 Seeing Ellie driving the vehicle, though only briefly, through the field made me think of how meadows challenge our notion of the ‘natural’. They are man-made habitats which have been around in their current form for at least 6000 years, when the Neolithic farming revolution reached its nadir or height, depending on your viewpoint. Much of the meadows and farmland we have today will once have been covered by wildwood, a habitat of nature’s own making that is lost to us in Britain thanks to thousands of years of deforestation by humans. Peterken suggests that meadows originated from woodland glades that once would have been kept open by aurochs (wild cows), deer and other large grazing animals. Something close to these old wildwood meadows are wood meadows still found in Estonia and Sweden. The seed had to be emptied onto the blue tarpaulin which was then sifted out using the homemade wooden frames and wire sieves. 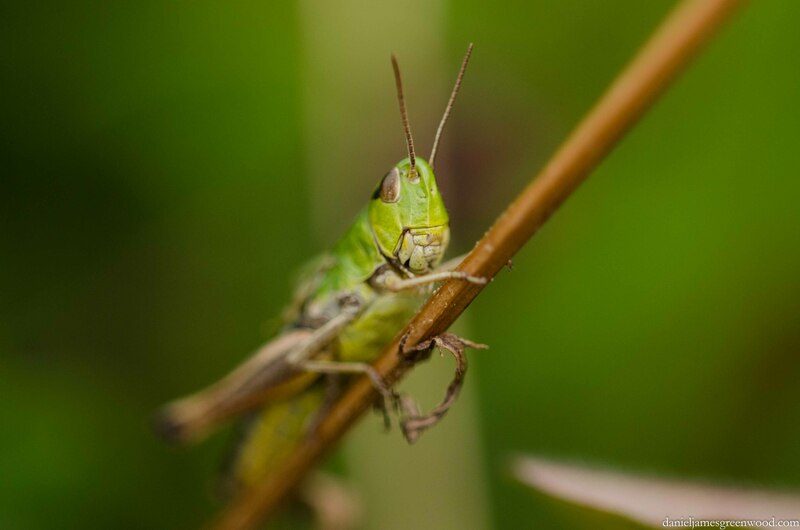 There was a lot of insect by-catch, most commonly grasshoppers and crickets, unfortunately losing one leg most of the time, and a few dead meadow brown and marbled white butterflies, and silver-y moths. 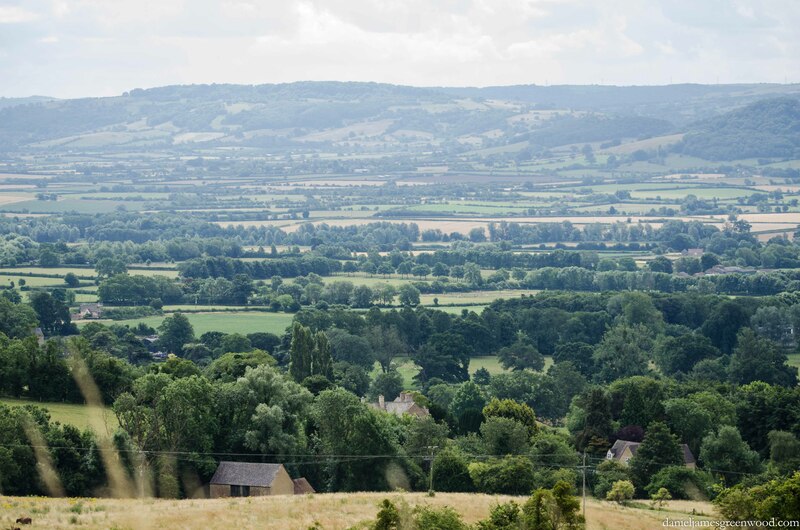 Don’t be upset though as these are common species in the Cotswolds which will, in the long term, be able to increase in number when the meadows diversify over a wider area of the AONB. The meadows were generally ‘over’ but there was still a lot of insect life. I think this is a stripe-winged grasshopper. Bumblebees were busy and looking worn from their summer work. This ‘rather faded’ common carder bee was on common knapweed. 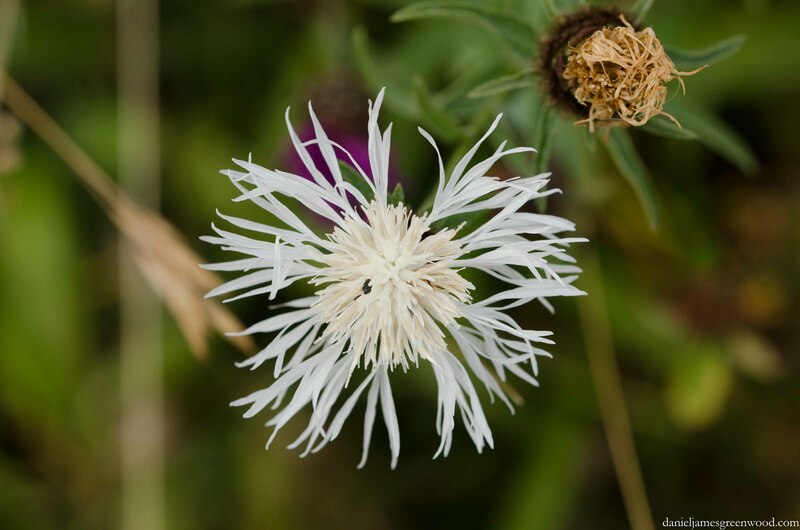 There were a number of wildflowers still in bloom, like this white variation of greater knapweed. It was not entirely possible to gather seed every day. 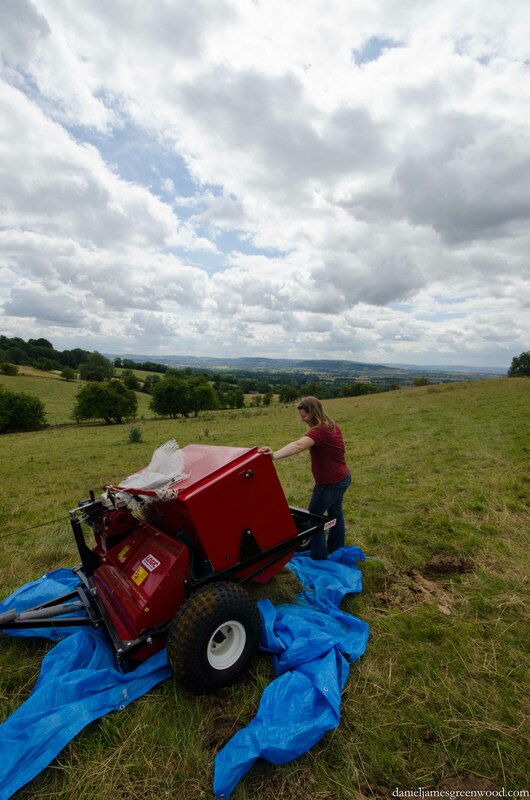 We tried to harvest at Leckhampton Hill, a site with very rich and beautiful limestone grassland. Only minutes after arriving and bringing the mower on site, a torrential downpour hit and the grassland become impossible to harvest. We had to return, seedless. 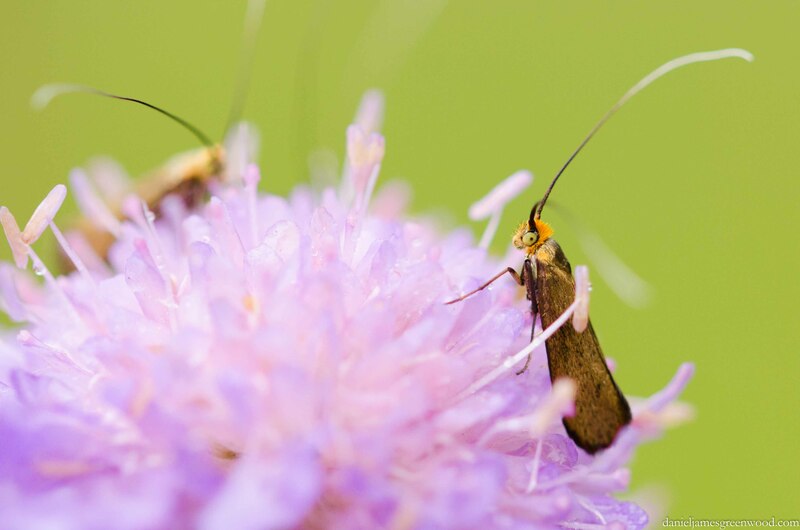 I took the chance to look for insects and found a gathering of longhorn moths, Nemophora metallica. I like this little punk of a micro-moth, it looks quite tiger-like to me. I’ve had to invest in the Field Guide to the Micro-moths of Great Britain and Ireland to acquaint myself with them. 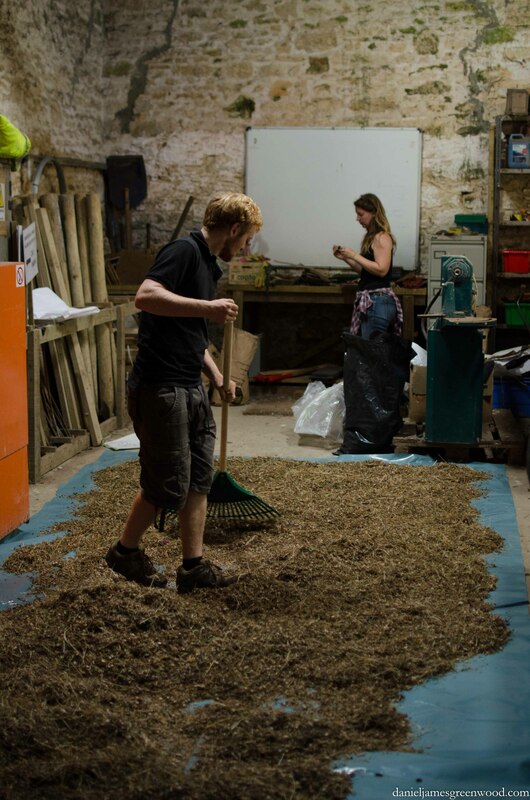 The seed had to be spread out in the barn after harvesting. Will and I (mostly Will, whose practical skills were, for a 21-year-old, amazing and embarrassing) raked out the seed onto tarpaulins. Will diligently turned the seed so that it would stay cool. If it got too warm and mound-like it would effectively begin to compost and decompose. 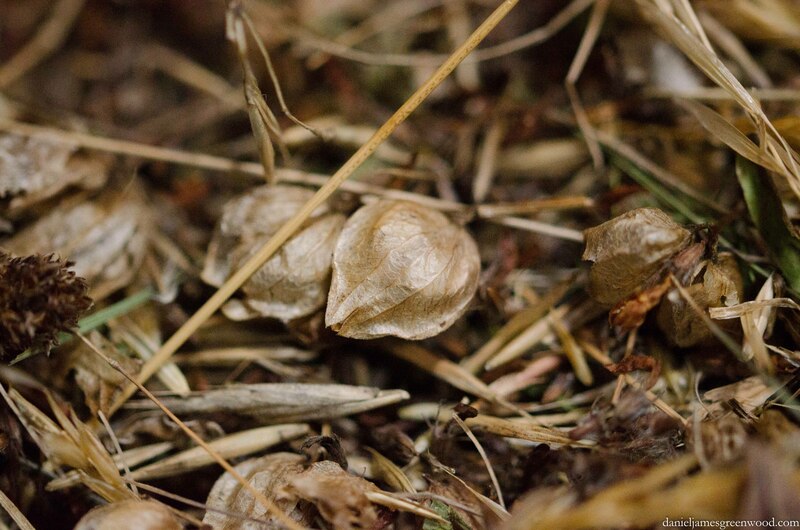 Here you can see the most sought-after seed, that of yellow rattle, a wildflower which is parasitic on the roots of grasses and so can help other less dominant, nectar-rich species to move in. Eleanor said that you only need a single yellow rattle seedling to establish for the plant to take hold in a meadow. Of course the conditions have to be right, this is a plant that likes calcium-rich limestone grassland like meadows being protected and enhanced in the AONB. When the seed was ready it was the job of Eleanor and volunteer Will (and me) to hand-sow the seeds, carrying them from point to point in dumpy-sacks. It was a real challenge to get it right and it will take years for the plants to establish. It’s a project that needs patience as much as it needs meadows to harvest. My final day of harvesting took place in Tewkesbury, an area of rolling hills with hay meadows and arable land lined by trees and hedges in the valley. The weather was warm and dry and therefore perfect for harvesting. 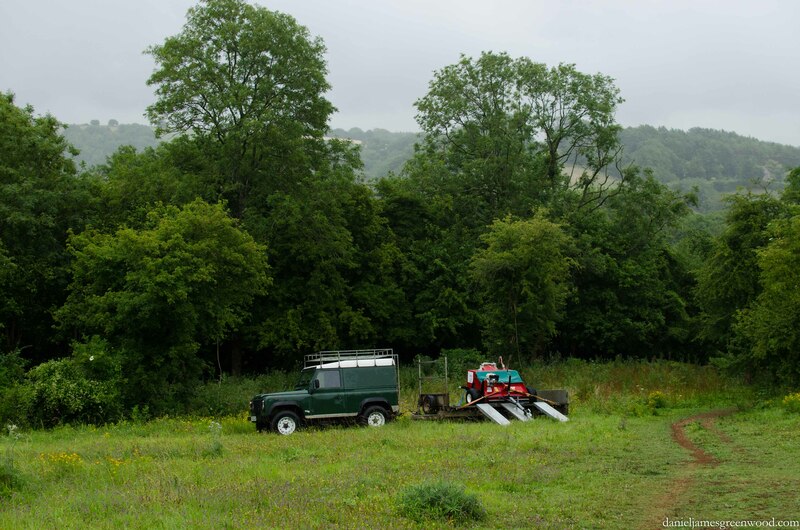 We harvested from a slither of the hillside which was designated as a SSSI (Site of Special Scientific Interest) but was in fact somewhat ‘rank’, meaning it was not so floristically diverse and instead was clogged with grasses. I did, however, find some wonderful (for spider-lovers) and a little horrifying (for bee-lovers) insect-life. Capsid bugs are a large family of insects with 229 species, known as the Miridae, but they’re quite easy to encounter if you have a macro lens for your camera or some other form of magnification. 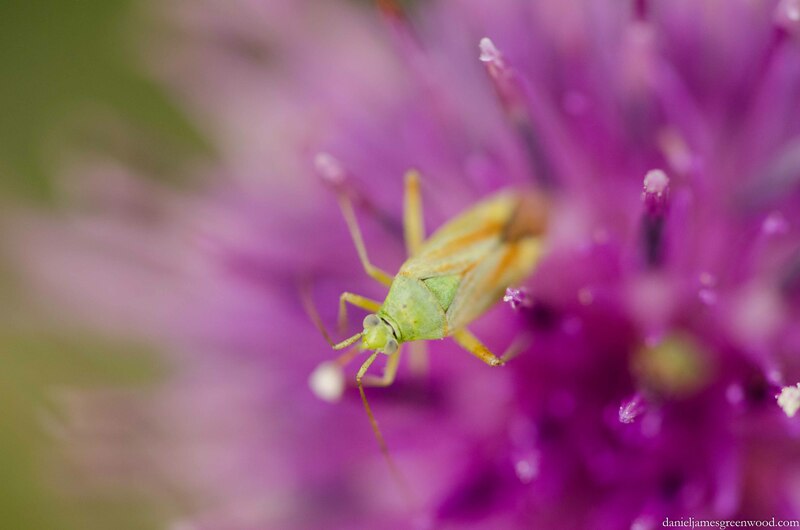 This capsid bug was traversing the stamens of knapweed. The SSSI was edged by a line of trees and dense bramble. 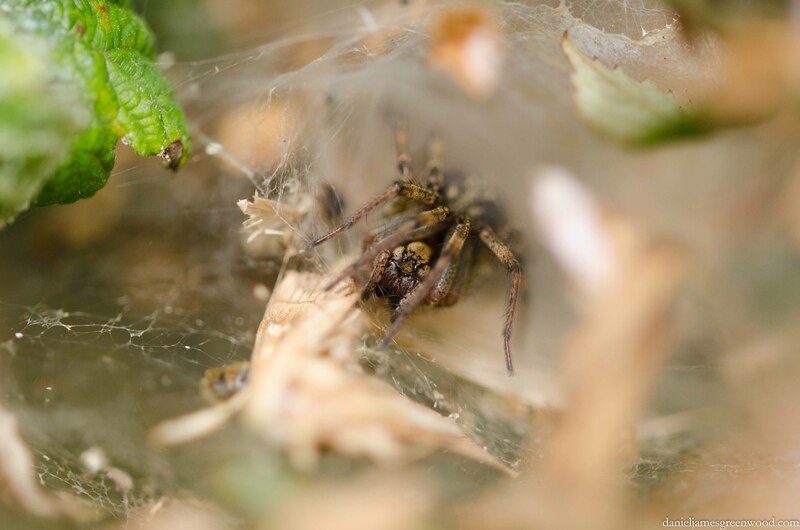 Hidden away in the bramble was this funnel-web spider that Will found. It had created a tunnel (or funnel) from which it could prey on insects. There were plenty of potential meals to be had. A lot has been said about the importance of meadows for bees and butterflies. Bees are also important for the other creatures that prey on them. 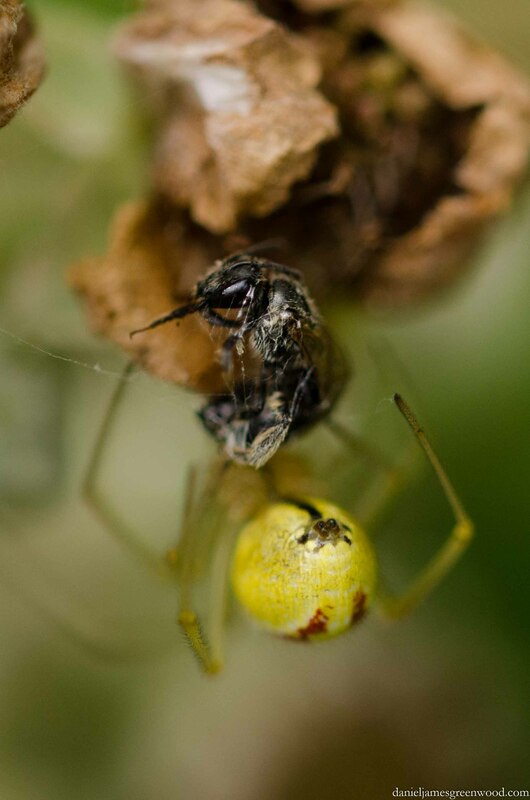 I watched this spider wrapping a solitary bee in its silk. The bee fought to try and free itself, but the strength of the webbing is not something that can be broken by a solitary bee. It was unpleasant to watch but also fascinating. You can be sure this is a scene that has been occurring for centuries in the meadows of the Cotswolds, with balances maintained within the ecological network by predators like these grassland-dwelling spiders. Nature’s beauty is indeed subjective. Don’t confuse this, though, its full-scale importance to us cannot be put in material or capitalist terms. Away from the harvesting there were a few signs of good government policy in action. Higher Level Stewardship (HLS) is a boring-sounding scheme which is being undertaken in different forms across the EU where farmers and other landowners receive funding from government to seed wildflower-rich margins, plant woodland, reintroduce grazing to ailing grasslands and replace lost hedgerow. This field had sidings of oxeye daisy, poppy, cornflower and a range of other native wildflowers which have been lost from British farmland in the past 60 years. Sadly, at the same time the Tories caved in to unrelenting corporate and National Farmer’s Union pressure to allow bee-killing pesticides once more, flouting an EU ban. Another national meadow project is Prince Charles’s Coronation Meadows scheme in partnership with the Wildlife Trusts and Plantlife. The heir to the throne loves the place so much he hung out with Eleanor in July. As for me, I got the chance to visit one near Morton-in-marsh. It was mostly covered by greater burnet, a member of the rose family that likes wet meadows and margins. The flowers were not at their full pomp in July, though the gentle spots of burnet and devil’s-bit scabious pointed to the richness of the meadow, the orchids having flowered and gone. There were lots of insects feeding on the still flowering burnet, like this hoverfly, a member of the Sphaerophoria family. And this male red-tailed bumblebee was working hard on this greater burnet flower. He had a fine yellow-beard. I’d like to thank Eleanor and Will for all they taught me about meadow restoration and the laws of the Cotswolds. Eleanor and her colleagues obviously work incredibly hard out there trying to improve the landscape for future generations of people and wildlife. It is no simple task but hopefully it will make a big difference in decades to come meaning more bees, butterflies and beautiful, vital wildflowers.